Gold has been one of the best performing assets since the October sell off in equities. The trend channel since recent lows is strong and the shiny metal continues trading within the trend. Moving averages are all looking “healthy”, but on a shorter-term basis, gold reversed a few days ago right on the big 1325 level. The positive trend is intact, but gold needs to catch some breath. First support is down at the 1290/1300 area. Gold is partly a function of the USD. 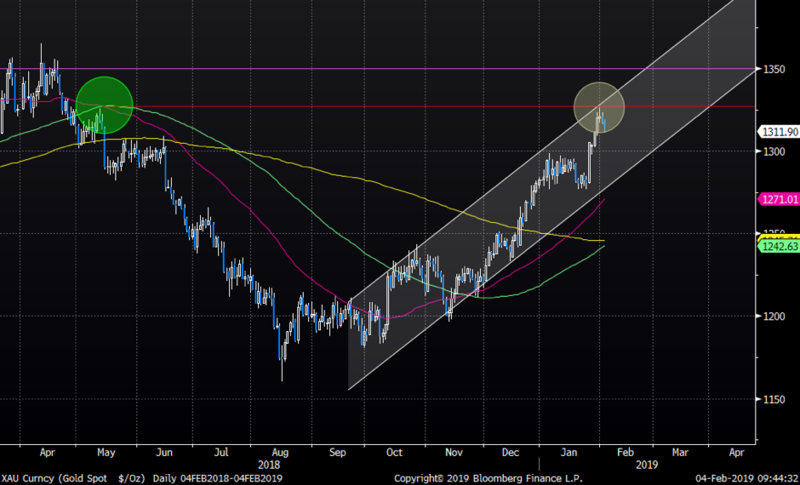 The DXY index reversed right on the 200-day average. 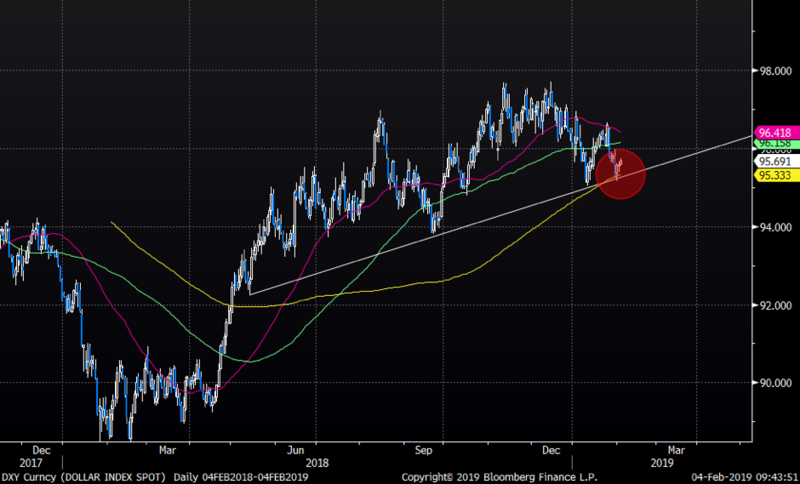 Short term DXY looks to continue trading within the relatively mean reverting and boring range, so we doubt gold will get much excitement from the USD on a short-term time frame. Another, important characteristics of gold, that investors have forgotten about over past years, is the safe haven/hedge feature. It looks like investors started “appreciating” the fear factor in gold when the October equities sell off started. 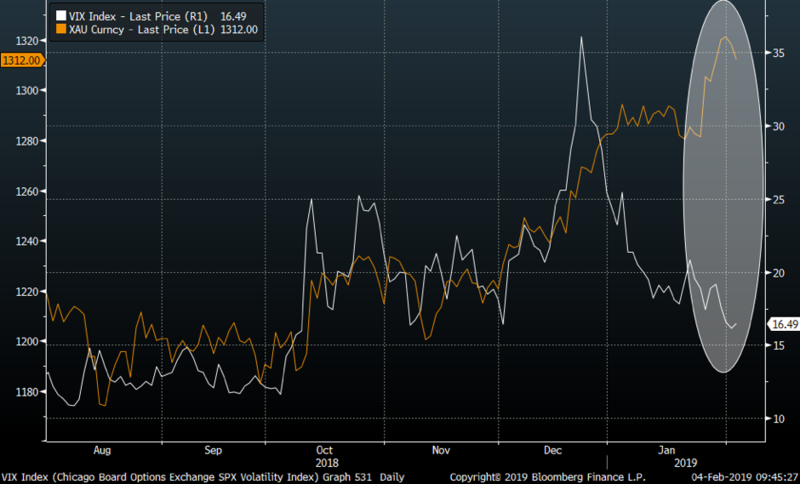 Gold and VIX traded in tandem until the gap started widening in January. Do note that VIX is mean reverting, while gold can trend as an asset, so the below image is not accurate on a longer-term basis, but it is interesting to see that the dislocation between the VIX and gold has diverged so much in January. Frequent readers of Askbrokers are familiar with our recent “tactical” view that VIX and volatilities should rise again, so we expect that gap to start coming in soon. Long volatility or a “macro” pairs trade between the two fear assets looks interesting to us.